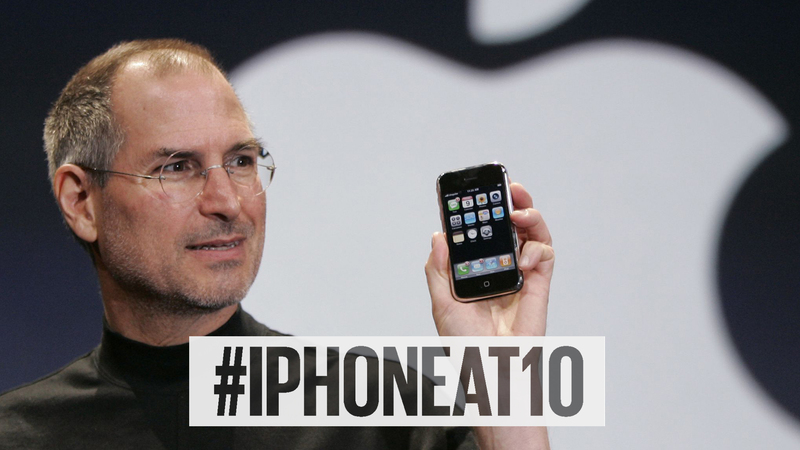 The iPhone is 10 and ooh how it has changed our lives. June 29, 2007 – Steve Jobs walked on stage and shocked the world. Like most things Apple, the iPhone wasn’t the first of its kind, but it was a quantum leap beyond the competition and spawned the mobile revolution. So much so, that few things were left untouched by its distortion field, as the iPhone literally put the internet in everyone’s pocket. I’ll never forget trading in my Blackberry for the first iPhone; it was like I had been living under a rock (sorry RIM) and forever changed my life. Steve Jobs was a proud papa, as he held his new baby Simba high in the air, “This is a day I’ve been looking forward to for two and a half years. Every once and while a revolutionary product comes along that changes everything – a widescreen iPod, a revolutionary phone, and a breakthrough internet communications device – these are not three devices but one… and we are calling it (dramatic pause)… iPhone. Today Apple is going to reinvent the phone.” And reinvent it they did. Mobile internet traffic took off, blowing by voice. Photography was fundamentally and dramatically transformed, moving it from a hobby, to an integrated part of everyday life (yes, we are all taking selfies). With social media platforms rising in tandem out of the ether, it gave all of us a place to post our many many photos. The numbers are staggering – 1.2 trillion digital photos will be taken worldwide this year and approximately 85% (according to InfoTrends), will be taken on phones. That’s apparently up from the 50% taken on phones and 400 billion in 2011. We didn’t even understand apps in 2007, but by 2008, Apple’s App Store had 500 players. Today, there are more than 2.1 million apps on the App Store and 3.4 million on Google Play. Think of the things we do with our phones now and what they have replaced – flashlights, maps and navigation, video cameras, home phones, weather, calendars, and alarm clocks – the list is endless. So big is the market that the combined publisher revenue for downloads and in-app purchases in the first quarter of 2017 exceeded $10.5 billion (according to App Annie) – and this doesn’t even include revenue from in-app advertising or commerce – think Amazon and Uber. Let’s ponder how we used to work for a second, as we are now connected/tethered at all times to our business (which sometimes may not be the best thing, but it’s a far cry from coming back to a mass of pink slips). iPhone apps have ushered in the on-demand work economy with an expected 8 million people active in the US alone by 2020. Case in point, I had my garage door fixed in hours the other day via an app to an on-demand trade – and it was seamless. The iPhone has changed so many little things in our behaviour, but I was shocked when I read this one: apparently, the iPhone has dismantled supermarket checkout merchandising, so instead of ogling impulse items like magazines and candy while bored in line, we’re staring at our phones. It has whacked gum sales to the tune of a 15% drop since 2008 says Euromonitor – chew on that one. Our smartphones have become an obsession. People spent more time consuming media last year than ever before, thanks to our ubiquitous mini screens. Socializing used to be, well… social, face-to-face, and not something consumed on a mobile device. Our smartphones have also cut heavily into newspapers, magazines, radio, and television. Our shifting eyeballs (and advertising dollars) have transformed the ad industry, making Facebook and Google the global advertising duopoly behemoths they are today.